If you are currently receiving long-term disability (LTD) benefits from work due to serious illness or injury, you may be wondering if at any point you may return to working again? With good medical care and adequate recovery time, it’s certainly possible to return to working at least on a part-time basis. However, most experts advise that it’s not advisable to head immediately back to work when on long-term disability because this can jeopardize your benefits. This is especially true if you are awaiting a legal settlement or getting disability benefits that are nearly as much as your previous wages. But, there are some ways to work and earn a small income while you are getting long-term disability. Some long-term disability plans prohibit working while receiving benefits, and they also define what actual disability is under the policy terms. 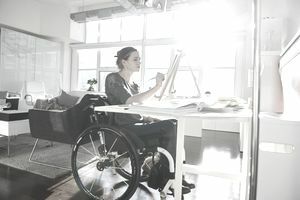 Long-term disability plans can include an occupational clause that qualifies members for benefits if they are unable to perform the “substantial and material duties” of their specific job as a result of a medical condition. It is referred to as “own occupation” or OCC. Other long-term disability plans include “any occupation” or ACC terms, which means the member cannot perform the duties of any job. Read through the summary plan documents of your LTD policy. If the long-term disability plan has OCC terms, one could reasonably perform light duty tasks that are not affected by the medical condition. Therefore a hobby business or part-time job is not out of the question. Keep in mind that the LTD plan may further restrict the types of work that can be performed (e.g., manual labor) and the hours worked and earnings may be limited to a certain amount per month. An important consideration is if you are trying to qualify for Social Security Disability benefits, in which case any type of job or other working arrangement is discouraged. Before considering any work or business opportunities that will require you to perform tasks of any nature, it is critical to seek the support and approval of your medical team. There are several reasons for this. First, you want to be sure to review any of the types of tasks you will be undertaking while working, even if they are light ones or you will be sitting. It can help identify any modifications that you need to work without reinjuring your body. Second, your doctor will be able to support your goals of returning to work so you can have the proper medical documentation to do so when you are ready. Lastly, during your recovery period, you will want to continue to be monitored by your physician to comply with the terms of your long-term disability insurance. It is always a good idea to speak with a qualified attorney before doing any work while you are receiving or hope to receive long-term disability benefits. This attorney should have a strong background in helping people who have been injured at work. Often, attorneys will coordinate with health care providers to ensure your legal rights are protected. An attorney can help you to understand better the terms of your LTD policy, including any limits on the amount of income you may earn. For example, the policy may become null and void if you are earning at least 80 percent of the value of the policy payments. Other policies may include an incentive to return to work, which allows plan members to earn their full benefits while also earning up to 100 percent of their previous earnings. You certainly want to make sure you are protecting your rights as an employee benefits consumer, and getting the most from this decision. Also be mindful of your rights and responsibilities if you are under workers' compensation insurance and care, as working may reduce or eliminate these benefits. Remember, as you traverse the next chapter of your life as a person who has been disabled at least partially as a result of work, you will want to choose a future occupation with caution. Avoid tasks that may cause you to become permanently disabled or those that conflict with your physical and mental well-being. Stick to the skills and abilities you have that will not cause you to become injured any further.